FCC Representatives with Ministerial Advisor on Telecommunications, Enrico Woolford and another official of the Ministry of Telecommunications with the FCC officials at left. The Guyana government hopes that expertise recently shared by top officials of the United States’ Federal Communications Commission (FCC) will help create a better regulatory environment. The American embassy in Georgetown said FCC representatives Nese Guendelsberger (Deputy Bureau Chief) and Robert Nelson (Chief Engineer) recently met with Minister of Telecommunications Cathy Hughes and provided technical briefings on a wide variety of topics including spectrum management and allocation, regulatory best practices, and telecommunications regulatory policy. 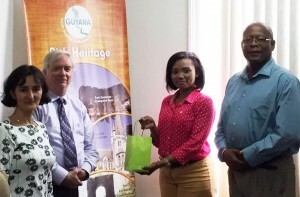 “Minister Hughes and the FCC representatives cited the importance of such capacity building sessions in assisting the government’s efforts to facilitate the development of world class telecommunications legislation and implementing regulations in order to assist in the development of this growing and vitally important sector of Guyana’s economy,” the American embassy said in a statement. The diplomatic mission said the FCC and the Ministry of Telecommunications pledged to continue cooperation as Guyana advances telecommunications modernization legislation. The visit by the FCC officials comes as Guyana prepares to liberalise the telecommunications sector by the passage of new laws. In addition to Minister Hughes, officials from the National Frequency Management Unit, eGovernance Unit, Public Utilities Commission, Guyana Learning Channel Trust, and Guyana Broadcast Board were in attendance. The FCC representatives praised the government’s efforts to modernize telecommunications infrastructure including its recent decision to allow cellular providers to launch 4G service in advance of Guyana’s 50th anniversary celebrations. While in Guyana, the FCC officials also had the opportunity to participate in the “Girls in Information Communication Technology” event designed to encourage young women to learn more about information technology. The FCC representatives highlighted the FCC International Visitors Program and online training as excellent opportunities for young women to become more knowledgeable about, and perhaps pursue careers, in the exciting and constantly changing field of telecommunications.